Germany is a global leader in many fields, as the leading economy of the European Union, and is among leading economies in the world, and is known as global export Champion. Thus, there are many opportunities for cooperation and business for the Israeli technology and cyber companies. 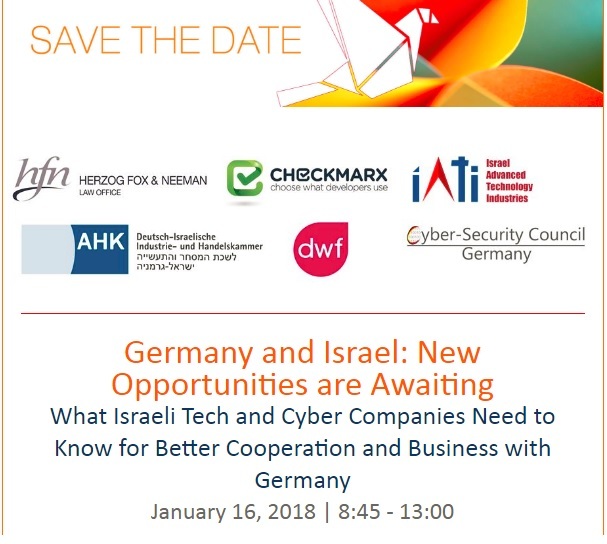 The Cybersecurity Council Germany, DWF Germany, and HFN are honored to invite you to a morning seminar intended to help the Israeli tech and cyber companies be better prepared towards Germany, with the focus on issues relating to cybersecurity and data protection, including the General Data Protection Regulation (GDPR) coming into effect on May 2018 in all countries members of the EU. Further, there will be a focus on incorporation and taxes considerations, negotiating software agreements, cooperation and joint ventures possibilities, and business best practices. All companies, including startups, and investors, doing or planning to do business in Germany, or have an interest in cooperation with partners from Germany, are welcome. Invited: C Level, VP’s, Business Development VP’s, entrepreneurs, investors.